High Wycombe, UK, 12 April 2018 – At Hostelco 2018 (16 – 19 April 2018, Fira Gran Via, Barcelona), international POS printer manufacturer Star Micronics will be exhibiting its ever expanding range of traditional and Tablet POS countertop and mobile printing solutions that respond to today’s rapidly evolving hospitality sector. Providing connectivity at all levels, Star will be demonstrating its latest models including the new TSP143IIIU USB printer, TSP654II CloudPRNT-POS™ and combined Bluetooth printer and cash drawer mPOP™ with leading software partner RoverCash (Lundi Matin) in Hall 7, Stand 638. As a global manufacturer of POS printers, Star provides the very latest tablet and cloud-based POS and hospitality solutions in a rapidly changing market. Star’s range of functional kitchen, hotel and bar printers as well as versatile mobile printers for table ordering offer the dedicated features required to ensure a fast and reliable service. 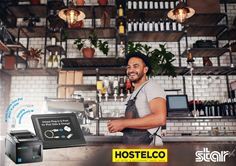 Our innovative products and multi-platform support allow simple integration with traditional or cloud-based hospitality software as well as custom Android, iOS and Windows tablet point of sale apps for the hospitality industry. The latest addition to the renowned TSP100 futurePRNT™ series is the unique TSP143IIIU – the only USB receipt printer today to communicate and charge simultaneously and directly via the Apple-supplied lightning cable with an iPad, iPod or iPhone for reliable USB communication. This printer removes the insecurity of wireless connection and seamlessly combines the flexibility and cost savings of tablet POS with the reliability of traditional POS. Star’s success with a large number of ISVs has been achieved via its attention to detail regarding SDKs and documentation enabling easy integration. Star’s experience is that many software solutions already work with the TSP143IIIU whilst others can easily integrate with the new SDK, knowing that it covers all products in the renowned TSP100 range. The TSP100 Series will remain the principal tablet POS printer series of choice due to its vast connectivity models including Bluetooth and WLAN. Demonstrating Star’s focus on connectivity, retailers can today purchase a Star TSP654II with a traditional interface in the knowledge that it is future-proofed for whatever cloud strategy the operator wants to adopt and provides an easy, affordable upgrade by simply replacing the traditional interface with the HI X interface. The interface can also be used with other Star printer models that offer 80/112mm label, ticket and receipt printing – TSP743II and TSP847II as well as SP700 matrix printer. Alternatively, the TSP654II HI X Connect receipt printer is ready for the Cloud with the interface built in. Both solutions offer intelligent printing for modern Cloud hospitality applications and, in particular, online ordering. The new Star TSP654II CloudPRNT-POS can be used as a hub providing IP connectivity via wired Ethernet or WiFi with peripheral support, by means of 2 USB host ports with full status back. Star’s SCD222 customer display, 1D / 2D (Symbol) barcode scanners and cash drawers are the preferred peripherals and can be purchased via Star’s distributors. Connecting the Star printer and device to the same network creates a complete and connected Tablet Point of Sale application that is easily accessible across any Internet enabled device. A number of software partners including RoverCash (Lundi Matin) have integrated the cost-effective all-in-one tablet POS solution, mPOP™. A unique combined Bluetooth printer and cash drawer mobile point of purchase station, mPOP is low cost and lightweight at just 10cm high and 30cm wide with a sleek design that will complement any countertop. Alternatively, mPOP with front feed receipting can easily be secured under the counter for enhanced space-saving.